Most Guam homes for sale come in a standard shape. There are not too many unique homes on Guam. Some of the more popular shapes and styles are modern, contemporary, and tropical. On Guam, because of the abundance of land, the most common type of home is a 1 story home, but in recent years, there has been an increase in 2 story homes. One of the things to keep in mind about Guam homes is that they are built out of concrete. Compared to wooden homes, they are very much indestructible. 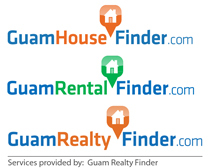 A standard size for Guam homes for sale is the 3 bedroom, 2 bathroom home. Most homes range in size between 1000 and 2000 square feet and are on land that is approximately 1000 square meters. Now in recent years, a trend we see is the square footage of the homes have stayed the same, but the size of the land has the house is built on has been getting smaller and smaller. Guam is no where near being over populated, but in the central villages, there is not too much space left. If having a big yard is on the top of your list, consider living in a northern village such as Yigo, or a southern village such as Talofofo. The price of Guam homes for sale can vary greatly on condition and location of the home. The condition of the home varies greatly on Guam with some newly renovated homes and some still with original fixtures from the 1970’s. Price of homes is greatly dependent on a combination of things. A basic standard home starts at about $190,000 and executive luxury homes can be as much as $1,000,000. The $190,000 homes would be basic 3 bedroom homes in a housing area outside of central Guam. While a $1,000,000 home would be a 5~6 bedroom home on the beach in a central village like Tamuning or Tumon. Also keep in mind compared to other parts of the world, Guam homes are constructed out of concrete which is much higher in cost compared to wooden homes. Location plays a big part in determining the price of a Guam home for sale. On Guam, the highest priced homes are the homes located in the central villages of Tumon or Tamuning. In terms of other desirable locations on Guam, beachfront homes are on top of the list followed by the ocean view homes. One of the biggest benefits of being an island is, the ocean is never too far. So even if your budget does not allow for a beach front or an ocean view, you are never too far from the beach on Guam.